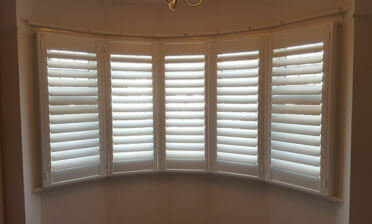 Ben was in Tunbridge Wells to install these specially shaped shutters for a client. The window area was angled, nearly a full triangle area but needing further bespoke design for the bottom flat edge. 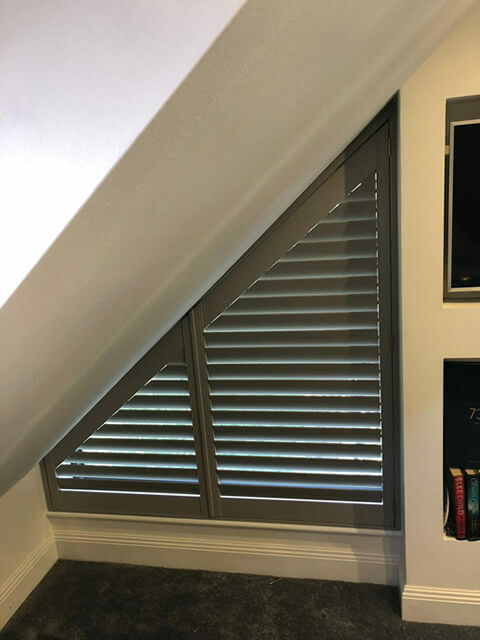 The great thing about our shutter design and installation service is that we can cater for all shapes and sizes of windows, even those with slightly irregular edges or angles. Our surveyors perfectly measure the exact sizing and angles so that the shutters we fit are millimetre perfect to the window recess. 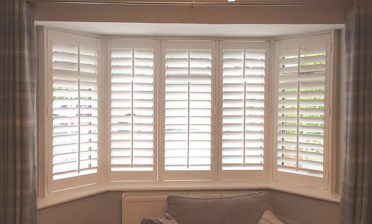 This window area would be near on impossible to dress with curtains or blinds so our shutters make for the perfect solution. 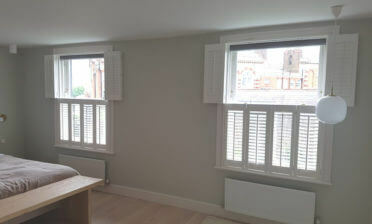 The customer was looking for shutters that fitted in with the existing décor, so after discussing the options it was decided to use a dark shade of grey to get the look they wanted. We think this colour sits so well against the lighter wall and ceiling above, working well with other elements in the room such as the carpet below. The shutters are created from our Fiji hardwood range and feature silent tilt rods, allowing for the shutters to be adjusted by hand, without any hindrance even though the shutters are not of a normal shape. They can also easily be opened for full access to the window behind!